Chipping Sparrow. original gouache painting copyright David Sibley. The simple trilled songs of species like Chipping Sparrow and Dark-eyed Junco offer some of the most difficult, and most common, identification challenges in bird song. There is simply very little information that we can glean from the songs to help us identify the singer. 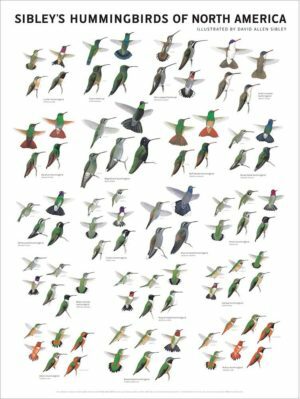 Each species sings a rapid series of very short phrases on a steady pitch, with almost nonexistent pauses between each phrase, and in our brain the sound runs together to form a continuous trill. Birds can hear a lot “faster” than we can, however, and consequently can extract a lot more information from the very rapid series of notes. The differences are there, and a Chipping Sparrow does not get confused by the songs of Pine Warblers or Dark-eyed Juncos. The key for the birder trying to identify these songs is to practice hearing the finer details. In most cases we can’t really hear the details of the individual notes, but we can hear the resulting “gestalt” differences in the overall tonal quality of the sound. Listen for those differences in quality, as well as upslurs and downslurs, the overall length of the song, changes in volume, and differences between songs within a singing bout. The trill of Chipping Sparrow is nearly twice as long as that of any other species, and this is a consistent and very useful clue. In addition, the overall quality of the sound is usually mechanical and rattling, due to the complexity of each individual phrase. This recording includes two different song types alternating from one individual bird. The first song is slow, the second fast. This alternating pattern is common in Pine Warbler and is a good identification clue, as the other species sing only one song type and do not alternate. The songs of Pine Warbler have the most gentle and musical-sounding overall quality of the group. This is a result of relatively simple whistled phrases, with less dramatic changes in pitch and less complexity. In the slower song here a clear upslur can be heard, as the ending of each phrase is distinctly higher-pitched than the beginning. No other species in this group commonly uses phrases that sound upslurred (Chipping Sparrow is just too fast and noisy to hear the pitch change), and that, combined with the musical whistled quality of the song, will allow you to identify most Pine Warblers with confidence. These recordings are of two different song types from one individual bird. 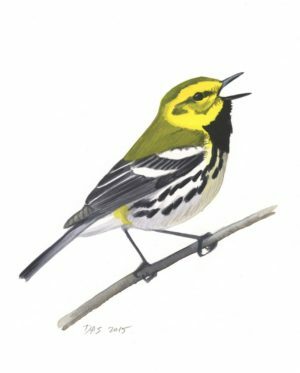 Each male has a repertoire of several different song types, but usually sings each one at least twenty times before switching to another, never alternating song types as Pine Warbler often does. The songs of juncos are often described as “loose” and “jingling”. They lack the relentlessly mechanical sound of the Chipping Sparrow. The relatively slow overall tempo and narrow range of pitch produces a more musical sound, but the complexity of each phrase does lend a mechanical element, which leads to the overall description of the song as a “musical rattle” and gives it its jingling quality. Compared to Pine Warbler notice that each phrase is descending in pitch. Listen to these recordings and compare to the Pine Warber above to practice hearing the difference in inflection. In addition, because of the very strong and clear notes incorporated into each phrase by the junco (especially in the slower song) the junco has a sharp “k” sound to the notes, as opposed to the softer “p” sounds of the Pine Warbler. The song increases in volume, starting softly and “swelling” to a much louder and stronger sound, unlike any of the other species in this group. This is a fast trill, with a very sharp staccato quality to the notes because each one covers a wide range of pitch, downslurred then upslurred, in a very short time. The quality of the notes is high and sibilant (almost hissing), not rattling or jingling. The combination of sharp staccato quality and swelling volume is distinctive. There is no getting around the fact that these four species have very similar songs, and require a keen ear and a lot of care to identify. But by focusing on the differences described above, you should be able to identify most of the trilled songs you hear, and with practice your confidence will steadily increase. 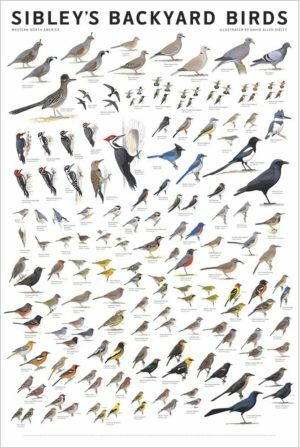 Having heard at one time or another all the above birds, I agree the best way to learn them is to listen to the actual bird singing in the wild to hear the finer points, such as speed, sound quality, volume changes, etc. Of course it doesn’t hurt if you hear more than one species at the same time and can compare the two! 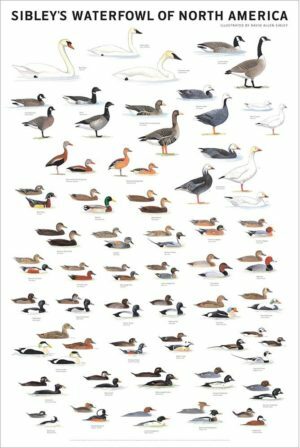 I would include Swamp Sparrow in this group of trillers. To my ears it sound similar to some of the Dark-eyed Junco songs. 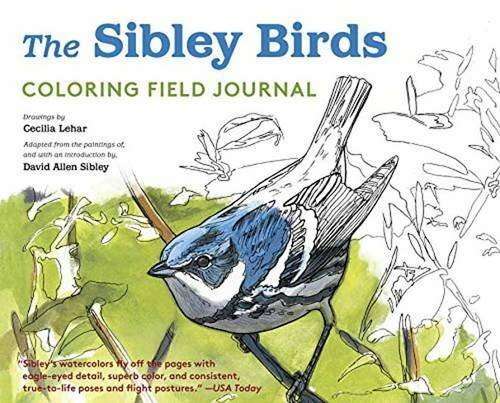 It is also one that birders often forget because of its reclusive nature. Habitat is also important in helping separate these species. Excellent blog. That post was very helpful! Can you create a post on western trillers? 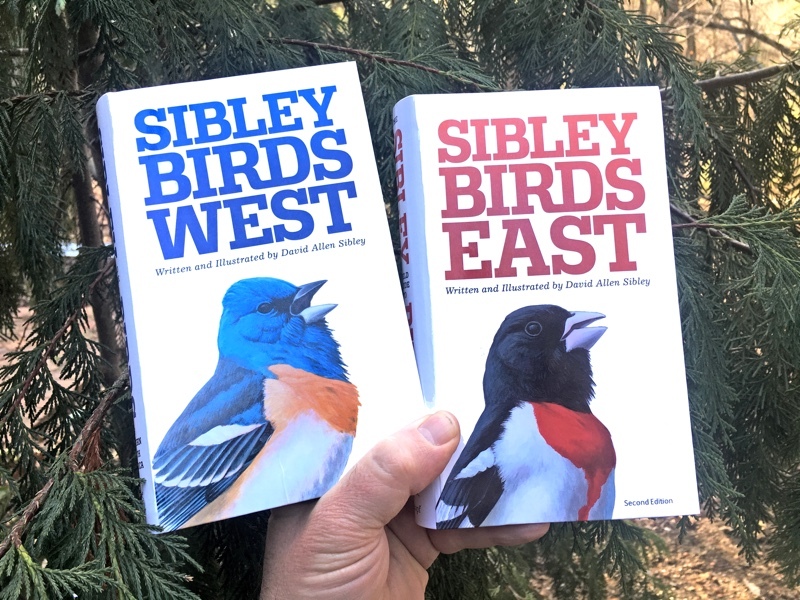 When I teach a late April bird song class at the Holden Arboretum in NE Ohio, we can have Chipping Sparrows, Dark-eyed Juncos, and Pine Warblers all in the same area outside the visitor center! Later on, the Juncos will only be down in the hemlock ravines where they nest, but for a couple of weeks during migration they are all singing together. What a challenge! I really like your detailed analysis of the Pine Warbler – thank you. I heard a short musical trill last week, and something in the song, perhaps the musical quality, told me it was a Pine Warbler and not a Chipping Sparrow. It responded to my iPod Pine Warbler call and I had a great view of this male Pine Warbler singing from an open perch just 15 feet from me. However, I returned to the same spot a week later, and again heard a pretty musical trill, only to find that this time it was a Chipping Sparrow! Other Chipping Sparrows in the same region were producing much more rapid and metallic trills. So the variation in “musicality”, and also in total length of the trill, by different Chipping Sparrows makes it difficult (for me) to be sure what I am hearing–and both of these birds live in similar habitat including conifers and some forest edges. There is nothing like actually seeing the singing bird to identify it with certainty! Hi Nicholas, Yes, it is difficult, and there are individual birds that don’t “follow the rules”. Seeing the bird is always the best way to identify these trills, but as you gain experience I think you will find that your ID by sound is more and more accurate, just because you are making more subtle distinctions in the songs. Recently I’ve been hearing a very interesting call, so I decided to search the web to try and find something, but haven’t been able to find the call. While I was looking through this section I heard the call 3 second into the Worm-Eating Warbler call, in the background. Could you identify that call for me? Thank you. I hear an Ovenbird singing at the 3 second mark there. Typically they sing two-syllabled phrases “Teacher Teacher …” but lots of them sing a simpler “Teach Teach Teach…”. The very strong and forceful quality (it sounds like a loud song), steady rhythm, and slight increase in volume are key points. Thank you for this super informative post David! 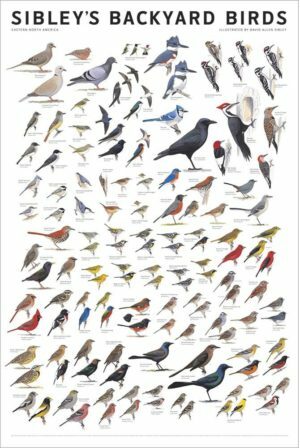 I am curious if there is any variation in what level in the canopy these birds generally sing? I hear a trill song from what sounds like 25-30 feet up in the trees and am wondering if each of these birds generally perch that high. Hi Alex, Thanks, I’m glad this was helpful. There isn;t any difference in the height of song perches in these species. Habitat can be helpful as a suggestive clue, especially in breeding season when they are more particular about the habitat, but there is still some overlap. I’m vacationing on N. Captiva Island in FL and heard an early morning trill that I’m trying to identify. It was in the alto range and lasted for three seconds, about 20 seconds apart. I’ve already ruled out Woodcock and Snipe. Any ideas? Thanks! In my backyard there is a very long loud trill. I don’t see any birds that are unusual, but I attract a lot of birds because I have many feeders and feed year round. I have heard it for several years. It goes into the night many evenings. I walked down there to see if I could see anything and it was just small birds. It doesn’t sound anything heard the lower pitched one and I heard what sounded like a shorter, more high pitched return all. My husband is wondering if it’s a frog or something. Could it be a dove? 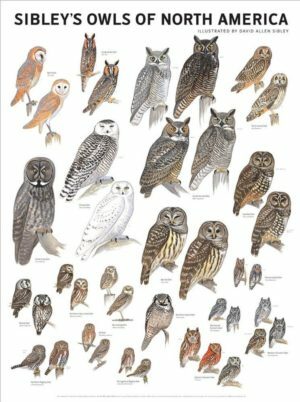 What do you advise to determine what bird or beast is making this nightly, beautiful call? I live in southeast PA, about an hour north of Philadelphia. Three seconds into the Pine Warbler recording is a very trill bird call in the background. Any help identifying the bird would be so appreciated! Have you checked whether it might be a veery? They have a haunting song that sounds to me like notes of a flute whirling down a vortex. More like “a trill falling off a cliff” than “piano keys being played down…,” but maybe. 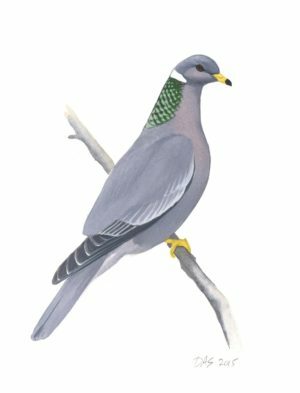 trying to find the name of a bird that is heard just around or before sunrise. I live in Quebec about 70 km from Montreal. The bird seems to sing two notes. My translation is meeeeeeeeee tooooooooooooooo. Can anyone help me? In Dallas looking for bird with repetitive call same pitch two slow followed by ten faster. But it’s a slow trill at the end. You could count exactly 10 at the end. High pitched and musical if that makes sense. If that’s not a match it will at least provide a starting point for comparison, so feel free to respond with the details of what was different about your bird sound. 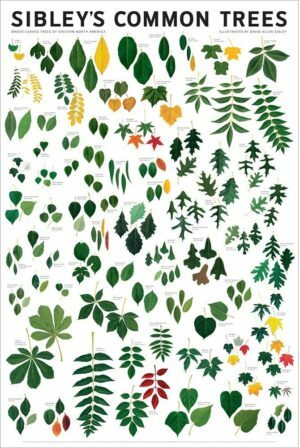 Hello, can you give me any help with a sound I keep hearing in my woods? I live in south central PA. If I had to illustrate the song, it would be a series of 5-9 apostrophes with little variation in pitch. They are quite staccato, not like a trill. Each one is accented individually but the whole song only lasts about a second. It is almost like ‘tick, tick, tick, tick, tick, tick tick! ‘ and seems to be coming from a high perch. 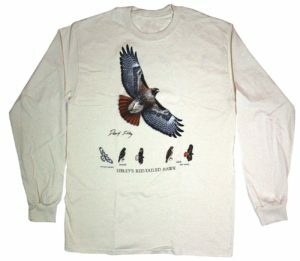 I’ve been through all my bird programs trying to track this down with no luck. Thanks for your time. Hi Jady, I’m afraid nothing comes to mind for me. If you can get a recording you can send a sound file to me though the contact link above, and I’d be happy to listen to it. Hello- I am trying to find out what bird I have been hearing over the years in northern Virginia that seems to sing my name! My name is Teresa and this bird seems to very loudly say “tah-ree-sa tah-ree-sa tah-ree-sa tah-ree-sa” the song is very loud and and clear with a slight stress on the first syllable. I have lived in northern va my whole life and have heard this bird many times. Always fascinated me but I cannot figure out what it is-even after lots of research! Any help you could give me would be so greatly appreciated! I must know the name of the bird that sings my name!! Hi Teresa, Carolina Wren might be your bird. 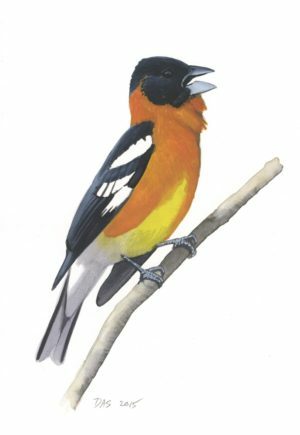 They’re common in Virginia and sing a repeated three-syllable phrase, loudly. I am looking for a warbler whose song is “teresa, teresa”. I once heard this bird in Newark, DE. I would like to know his name. I’m doing field work in Wolf Point, MT, and the last couple of months I have heard a bird (or insect) have a very fast one-note trill for >20 seconds at a time. Thoughts? It’s located in rangeland/wheat fields. Hi Brandon, Any sound that continues that long – 20 seconds – must be insect and not bird. All of the trilled bird songs are much shorter and the length doesn’t vary much. Lang Elliott put together a book and CD of grasshopper and cricket sounds a few years ago, and that’s where I would start to try to ID it. Thank you for your reply. That is an interesting resource that I’ll have to buy. I never usually hear words in bird song. But I hear a bird saying “sue ee sue wee” right now in S. Fl. I can’t find it with my binos. I am hearing a bird that I am pretty sure is an orange-crowned warbler who is not supposed to be here in southeast Virginia in June and is uncommon other times of year–though I have heard it in the same area in fall and winter. I can never catch a glimpse of it, but it seems to hang out in mixed pine and deciduous woods with thickety areas. Sometimes it is mid-to high in a tree; other times it is in the thickets. 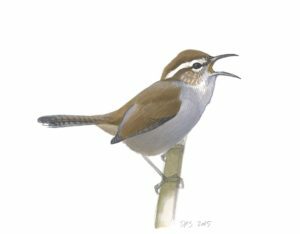 The song is a rapid trill that is more musical than a chipping sparrow and even than a pine warbler, and varies between two and three pitches. It begins on one pitch, goes up to another, and ends on a lower pitch. Sometimes it has only the middle and end pitches. It increases in intensity, though not to the same degree as the worm-eating warbler. I would like to upload a recording but do not see a way to do it. I live in northern Michigan. I heard this bird song this morning. High pitched series of one note,then 3,then3, then 1, then 3, then 3,then 2. Sounds like chee,chee,chee.Thank you. Hello, I came here to identify a bird vocalization I was hearing today from an airborne flock. They were flying in a very loose group. Not like pigeons or starlings in that they each kept their own path. if you were to trace their paths you would have a big scribble moving back and forth. Meanwhile it sounds like only one or two at a time are vocalizing. 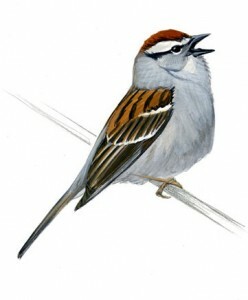 the vocalization sounds like the”Chipping Sparrow” above except that the pitch gradually falls a couple of octaves. Unable to find any recordings closer to it than the chipping Sparrow sound. 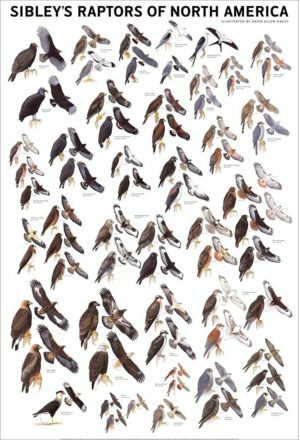 anyway, here’s a question: There is a black bird you will find in southern California (I have seen them in San Bernardino Fontana and Hesperia) that is so loud that it sounds fake. its a raspy, “greeeep”, sound they will repeat 6 or 7 times sometimes with clicks and whistles following. its the loudest bird I have ever heard, including the parrots cockatoos. it literally sounds like it is coming out of a bull-horn. Anyone know this bird? Point of interest: If you’re ever in San Diego go to Harbor Island and listen to the little birds in the trees. They mimic the sounds of the airplanes landing and taking off, the sounds of the sirens going by, and the most interesting vocalization I’ve heard them do is the sound of a fisherman’s reel. there are people that drive up and put their chairs on the sidewalk and cast out into the harbor. the birds there do the entire sequence, from casting the line “BZZZZzzzzzzzz” to the “clicklunk tic tic tic tictictictic….” but they shorten it to about 6 or 7 seconds I think. It is the coolest thing ever and nobody there even notices it. It’s very subtle too, but if you sit close by and pay attention you’ll hear it. 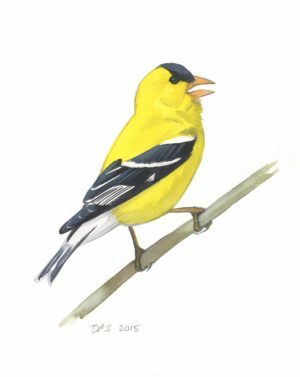 I’ve heard a bird song for years in Maryland, not far from DC, and I haven’t been able to identify it from any guides. I also haven’t been able to see it when it’s singing, so I’m guessing it sings well hidden in a tree. The song has three syllables and sounds to me like a trilling “wheet wheedle,” with the accent on the second syllable. The second syllable is higher pitched than the first. Can anyone help with an ID? Hello David or others- I was in Rehoboth Delaware near the shore but in a residential area. Every day I frequently heard an extremely loud trilling bird (clearly hanging out in the tall trees)- singing 3 descending notes repetitively – sounded like 3 Blind Mice in a minor key. Any ideas?